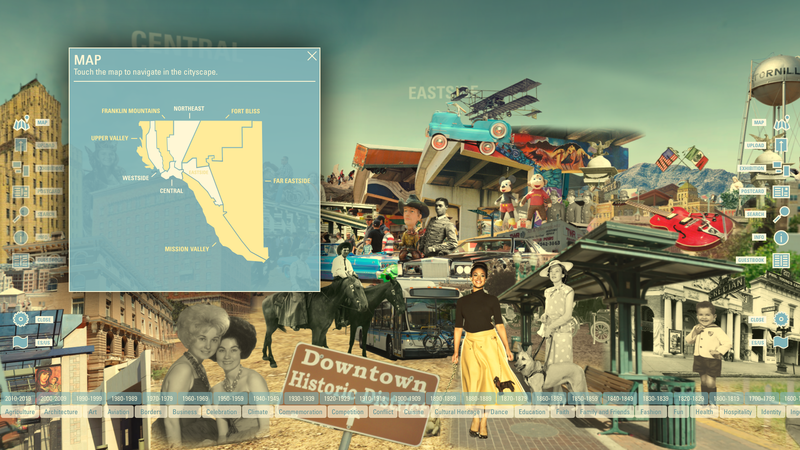 DIGIE is a Gibson Walls visitor experience commissioned by the El Paso Museum of History, Texas, USA. The objective was to provide a digital gateway that allows all members of the El Paso community to explore and celebrate the history and culture of El Paso in an entertaining and informative way. It needed to be bilingual with an interface that could be understood quickly, allow user contributions and encourage exploration of the Museum itself. And it had to be “bigger than Texas”! The result is a strikingly beautiful and enjoyable visitor experience that has doubled museum visitation. 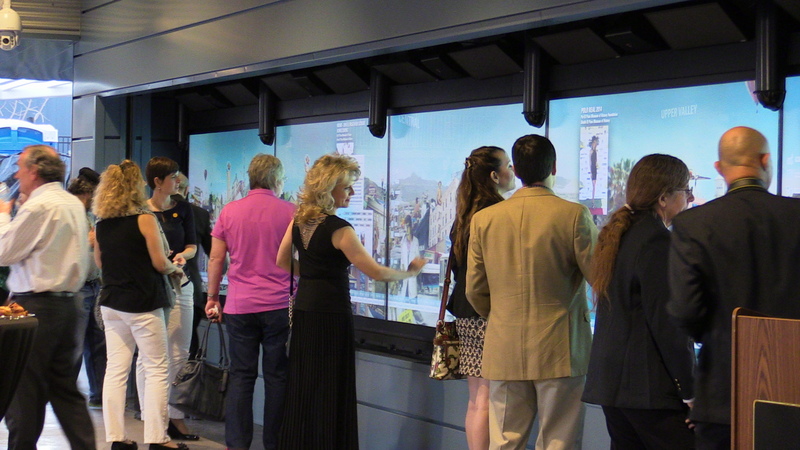 Visitors discover the history and culture of their city as a 3D graphic world displayed on a 36ft (11m) touchscreen built into the exterior of the museum entrance. 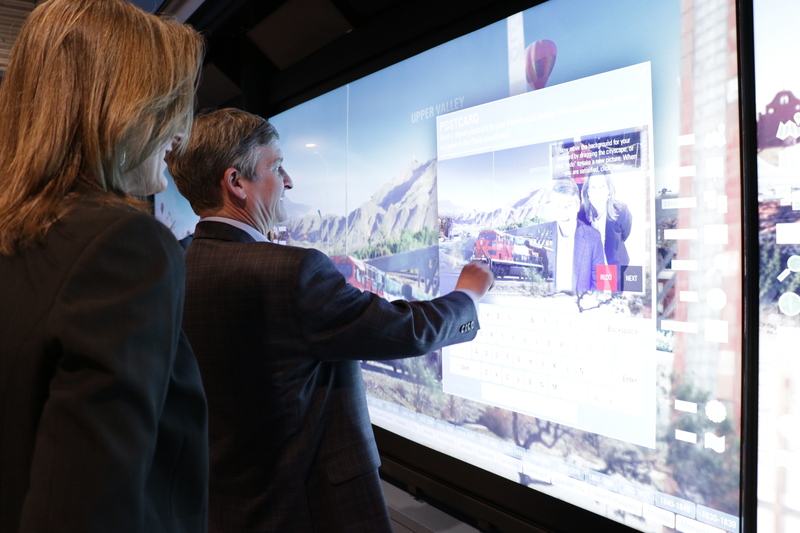 The bilingual interface is crafted from thousands of images and videos from the historical collections of the museum, allowing multiple visitors to playfully explore El Paso’s diverse culture and heritage at the touch of a finger. The user journey experience is non-linear and participatory. Visitors can explore the city in any direction they want, encouraging exploration of the geography, history and themes of El Paso. 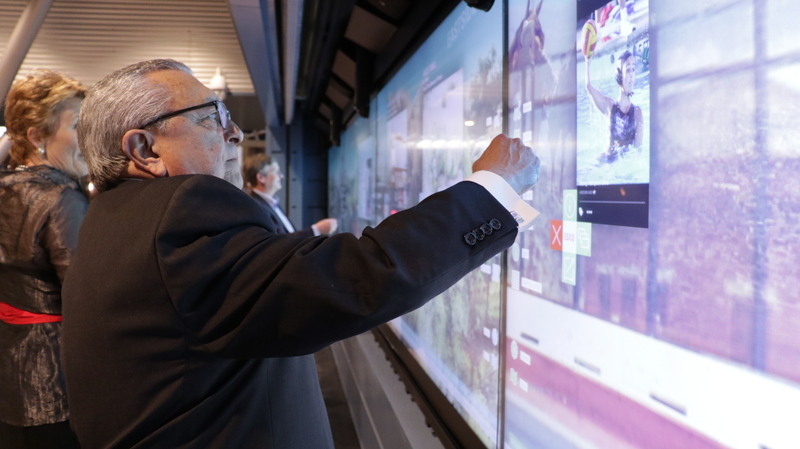 Visitors are also encouraged to upload their own contributions while at the Wall (or through the companion website) – images of their life, family, history and culture – ensuring a fresh, collaborative content experience and a growing community collection. 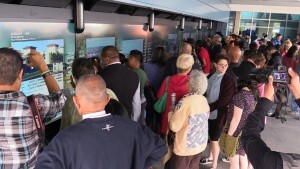 A popular feature is to use the wall’s cameras to snap a selfie, which becomes a postcard from that part of the virtual city that can be emailed immediately. The result is a democratic and ever changing experience that users form a deep connection to. After 12 months it has had over 800,000 individual media views of the content and stories that it houses. This from a city with a metro population of 830,000 people. The exhibition is designed to operate 365 days a year without being manned, and being built into the exterior entrance to the Museum of History can open beyond normal opening hours. This enables any passersby the chance to interact with the Wall at their convenience without setting foot inside the museum. 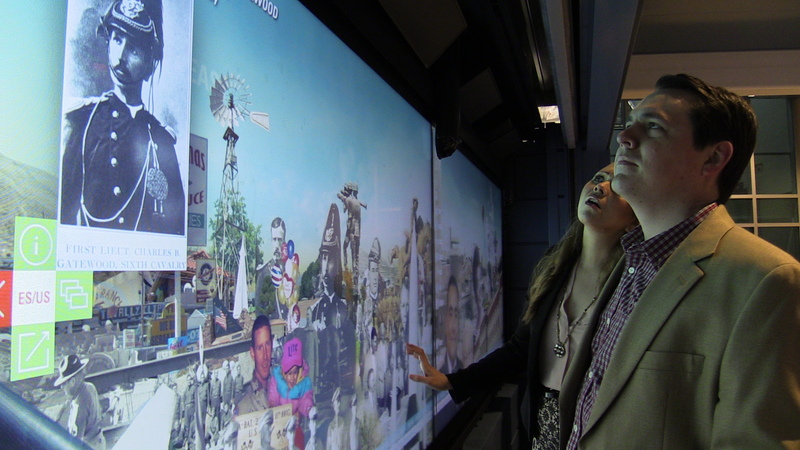 A companion ‘Mini-Digie’ 75” screen unit takes the museum into the community, visiting schools and public events. Any comments and content uploaded from either instance syncs with each other. The design and construction of the international project brought together curators, engineers, IT specialists and project managers from the city of El Paso, as well as specialist exhibition and technology experts and leading digital artists from around the world. While not accessible online, the exhibition can be reviewed via Skype appointment with Brett Tompkins (Senior Producer, Visitor Experiences). The interactive display is also demonstrated in the above video.